The Schiebel Camcopter S-100 is equipped with a VTOL system. The S-100 LCD screen panel. The S-100 performing search and rescue operations. The S-100 taking off from the UAE army base. The S-100 undergoing flight tests. The Schiebel Camcopter S-100 is a medium-range, medium-endurance, unmanned air vehicle (UAV) system manufactured by Schiebel Corporation, Austria. It was designed for the United Arab Emirates (UAE) Army and the German Navy to perform a range of missions, encompassing general surveillance, border patrol, fire control, target designation, damage assessment, mine detection and other marine roles. The UAV can also perform search and rescue operations, aerial photography and even crowd control using tear gas in civil applications. The Camcopter S-100 is the first UAV to be showcased at the 2009 Le Bourget Air Show held in Paris, France. The S-100 has also been displayed at the ILA Berlin Air Show at Berlin Schonefeld airport in June 2010. "The UAE Army has procured 40 S-100 UAVs." The Camcopter S-100 is equipped with a vertical take-off and landing (VTOL) system, which eliminates the need for automatic launch and recovery (ALR) equipment. The GPS wavepoints of the VTOL system are fully pre-programmed, allowing the UAV to fly in an autonomous mode or be manually operated by a pilot. The VTOL system offers fully automated take-off and landing even in adverse weather conditions, and reduces the need for operator training. The US Air Force Research Laboratory (AFRL) awarded an $11.7m contract to CenTauri Solutions to examine the feasibility of the S-100 UAV in detecting the improvised explosive devices (IED). The project is known as ‘Yellow Jacket’. In October 2009 CenTauri Solution awarded a sub-contract to Schiebel for supplying the S-100 UAV for the Counter IED project. On 9 June 2010, Schiebel announced its decision to incorporate an additional external fuel tank to the Camcopter S-100 UAV to increase its range, endurance and electrical power outputs. The UAV will also be upgraded to accommodate 80kg of external under-slung loads. The UAE Army has procured 40 Schiebel S-100 UAVs with the option to buy another 40. Acceptance tests of the S-100 were completed in March 2006 and the vehicle met all the performance requirements. Around six Camcopter S-100 UAVs with improved sensors were ordered by the German Navy for use in the Braunschweig Class corvettes. The German Army is also planning to procure S-100 UAV for its land-based missions. Three more undisclosed nations also ordered the S-100 UAV, thereby increasing the total number of orders to 200. The Camcopter S-100 has been designed as a versatile UAV to accommodate a variety of payloads, which vary with customer requirements. The UAV is designed to carry a 34kg payload for up to six hours in a standard configuration. 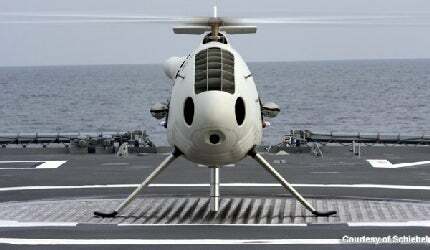 It can land on helicopter deck-equipped ships without the use of additional landing equipment. The S-100 UAV comprises two payload bays, side hard points and an internal auxiliary avionics bay. The primary payload bay is located just beneath the main rotor shaft and can accommodate payloads up to 50kg. The daylight and infrared cameras mounted on the UAV allow the operator to capture images in adverse weather conditions. The Camcopter S-100 UAV is powered by a single 50hp Diamond engine and can carry various payloads such as EO and IR sensors. "The Camcopter S-100 UAV has a ROVER system." The S-100 UAV was fitted with a Remotely Operated Video Enhanced Receiver (ROVER) System on completion of successful testing on 8 June 2010. The system offers the ground control station operator exclusive views of the images captured by the S-100. The entire real time intelligence data from UAV is directly transmitted to the ROVER system and is displayed on a small monitor or laptop. The Camcopter S-100 can be controlled either manually from the ground control station or through the autonomous mode. It is fully equipped with a VTOL system, which helps during automatic safe landings when communication is lost with the ground control system. The navigation computer, equipped with an inertial navigation system (INS) and global positioning system (GPS), can store and manage all GPS wavepoint commands allowing the UAV to operate irrespective of the control station. The S-100 UAV has electro-optical (EO) and infrared sensors, as well as thermal surveillance equipment. The EO sensor converts light rays into electronic signals for capturing images, real-time data and videos. Thermal surveillance equipment is used to capture high-resolution images during night by penetrating through clouds, rain, smoke, fog and smog. The S-100 UAV is equipped with a synthetic aperture radar (SAR), ground moving target indicator (GMTI), a laser imaging radar (LIDAR) and a ground penetrating radar (GPR). The GPR is used to detect the mines. The maximum and cruise speed of the Camcopter S-100 UAV is 222km per hour and 101km per hour, respectively. It has a maximum endurance of six hours. The vehicle’s range ceiling is 180km and its service ceiling is 5,486m. The UAV weighs around 100kg and has a maximum take-off weight of 200kg. The A160 Hummingbird long-endurance helicopter UAV is capable of carrying out persistent intelligence, surveillance and reconnaissance, target acquisition, communications relay and precision resupply missions. The processing, retrieving and storing of the real-time data provided by the Camcopter S-100 is carried out by a GCS. The GCS is equipped with two computers manufactured by Schiebel Corporation, which are used for mission planning / control and payload control / image retrieving. The mission planning / control workstation displays the aerial vehicle (AV) position and detects threat zones, no-fly zones and other intelligence information using geographical information system (GIS) data. The entire mission can be monitored in a 3D artificial environment on an LCD screen panel. The payload control computer manages the payload of the AV while accessing the data provided by the mission planning workstation. The pilot control unit in the GCS controls the AV manually by providing directional commands through a joystick attached to the AV’s on-board navigation computer. The control screen is used for displaying the flight status data as well as switching the AV to different modes, namely VTOL, automatic, manual and return-to-home mode. An intelligent interface unit with PowerPC core processors, which acts as a communication link between the GCS and the vehicle, is also installed in the GCS. The payloads and imagery data captured by the UAV are transmitted to the earth station via the line of site data link. The control station is also fitted with a remote data terminal, which enables the operator to view the payload imagery and flight data in real-time during missions.